Entertain guests often? Need a Bigger and Better place to accommodate guests? A Pavilion is the Perfect Solution! A Custom Built Pavilion might be just the thing to vamp up your outdoor space! Pavilions give you the ideal space for your next barbecue! With the options of varying sizes, we are sure to be able to meet any and all of your requests! Unsure of what kind of Pavilion you need? Give us a call! We will evaluate your property and your specific needs to see what would best suit you! We want you to get as much use out of your Pavilion as possible! All of our materials are hand picked for each specific project! We want you to get exactly what you are looking for, and we aim to give it to you! We are not satisfied until you are 100% satisfied with the final result! On a Budget? Not only are we budget friendly, but we also have Spectacular Financing Options! So if finances are holding you back from getting the backyard of your dreams, wait no more! We are sure to be able to work something out with you! We want you to enjoy a space you can love for years to come! 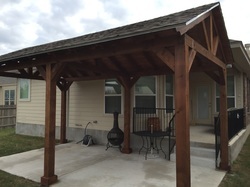 "Awesome job on our back porch deck and gazebo. We love it and will recommend you guys to everyone! Thanks"
"Your team did an amazing job in our back yard. The fence you put up is exactly what we were needing and still allows air flow!" "Thanks to the whole crew for the beautiful Gazebo built for us. The custom embellishments and staining are the perfect touch." © Copyright Boerne Deck Builder. All rights reserved.